Leukoplakia is white patches in the oral mucosa. It is considered a pre-malignant lesion. The transformation rate in various studies and locations ranging from 0.6 to 5%. Factors most frequently blamed for the development of idiopathic Leukoplakia include tobacco use, alcohol consumption, chronic irritation, candidacies, vitamin A or Vitamin B deficiency and endocrine disturbances. Any suspicious areas should be referred urgently for biopsy. 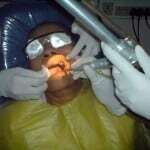 and	Surgical excision of Leukoplakia may be considered. Laser ablation is the easiest mode of treatment. It is done under local anesthesia in the OPD or minor OT. and	Frequent clinical observation accompanied by photographic records is recommended. Because of the unpredictable behavior of dysplastic lesions, immediately obtain a biopsy on any areas that are suggestive, or that change in appearance.